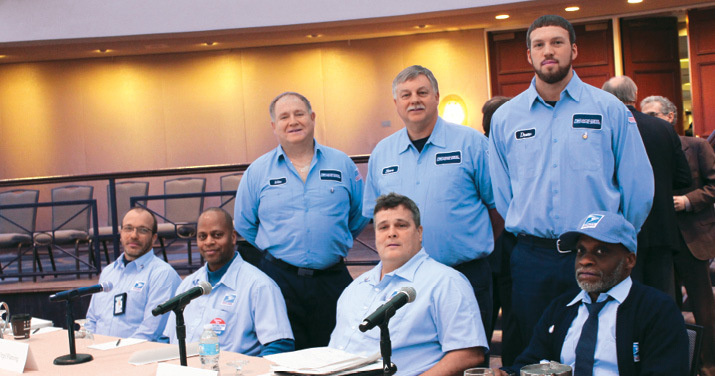 07/25/2016 - With temperatures soaring, many Motor Vehicle Service Craft employees have complained about management’s failure to maintain functioning air conditioning systems in their trucks – and the APWU has addressed those complaints at the national level, Craft Director Michael O. Foster reports. 06/22/2016 - The APWU is urging President Obama to veto an appropriations bill if it comes to his desk with a provision that would weaken truck safety regulations. As it is currently written, the appropriations bill for the Departments of Transportation (H.R. 2577) includes a section that would block implementation of DOT rules that limit the number of hours drivers can be on duty. Virgil Fleming, Kevin Knapp and Robert Strickland. The American Postal Workers Union has entered the final step in our fight for a good contract: Interest Arbitration. This is a process whereby issues that were not resolved during negotiations between the employer and the union are presented to a neutral arbitrator, agreed upon by both parties, for a final and binding resolution. 03/17/2016 - The APWU won an important victory on March 15 – one that will save lives and help protect the jobs of Postal Service drivers. A shocking lack of security at many of the nation’s 21 Network Distribution Centers (NDCs) is jeopardizing the lives of postal employees. Unfortunately, postal management seems unresponsive. The union and management resolved a dispute in august concerning the Postal Service’s decision in April 2002 to waive the Commercial Driver’s License requirement for applicants for Automotive Mechanic/Technician and Lead Automotive Technician positions. The Motor Vehicle Craft has always insisted that successful applicants or bidders must meet the minimum qualifications of a position before they are deemed qualified. However, the Postal Service’s decision to voluntarily participate in the Department of Transportation’s Commercial Driver’s License (CDL) program in 1995 created difficulties recruiting qualified mechanics and technicians. Many applicants had the necessary skills but did not have CDLs.